Yu-Gi-Oh Zexal Volume 4 cover image is courtesy of barnesandnoble.com. Part of the Yu-Gi-Oh! franchise, Yu-Gi-Oh! Zexal follows Yu-Gi-Oh! 5D’s. Zexal is set in futuristic Heartland City. It focuses on Yuma Tsukumo, a hot-bloodied young fellow who wants to become Duel Champion. Yuma is accompanied by Astral, a mysterious spirit that only Yuma can see. Together, they search for Numbers, special cards that hold Astral’s memories and are also highly sought after. Yu-Gi-Oh! Zexal, Vol. 4 (Messenger from the Moon! !, Chapters 19 to 24) opens with the sudden appearance of the mysterious Luna, who calls herself a messenger from the moon. Luna comes with a challenge for duelist, Ryoga Kamishiro AKA “Shark.” Plus, the history of Ryoga and his friend, Kyoji Yaguma, are revealed, just as Kyogi reappears with new friends. The Numbers Club gets its own headquarters – thanks to Cathy. This is just in time, as Numbers battles seem to be popping up all over the city. THE LOWDOWN: In my review of the third volume of the Yu-Gi-Oh! Zexal manga, I wrote that this series is the most kid-oriented Yu-Gi-Oh! manga I’ve read. Well, now I’m a kid, too. I just read Yu-Gi-Oh! 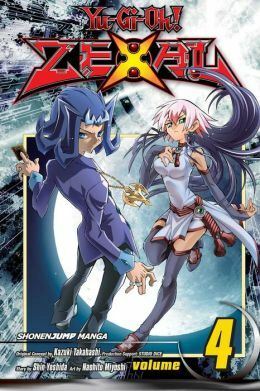 Zexal Volume 4, and I loved it. What the hell is wrong with me?! Who know? I may not like the next volume I read as much as I like Vol. 4. However, the six chapters that comprise Vol. 4 are just the right mixture of duels, conspiracy, back story, revelation, betrayal, and cliffhanger to pique my interest. VIZ Media has sent me several volumes of Yu-Gi-Oh! manga to review over the last several years. This may be the best one I’ve read… so far.